I have this job thing that’s pretty cool and keeps me on my toes…oh, and it pays the bills for our farming habit. I went to work Friday morning and returned home Saturday morning after completing a large, multi-month project. There was no chance to catch up on sleep on Saturday so when Sunday rolled around I was a little cranky. Sunday was scheduled processing day for 100 broilers. No big deal, just a couple of hours worth of work. We slept in then worked around the farm and house Sunday morning at a leisurely pace then started on the chickens at 1:00. I had big plans to process a couple of roosters and a dozen or so ducks while we were at it. Well, it shouldn’t have been a big deal. Our scalder broke. More specifically, the solenoid on the gas valve burned out. I could light the pilot light but the burner wouldn’t fire. I noticed this about the time the 10th bird was in the scalder. Things just weren’t going right. At 20 birds we called an all stop. So there I was, covered in chicken blood. My kids were waiting anxiously to complete our work so we could go inside, clean up and watch Star Trek. (We always watch Star Trek on Sundays.) My wife was miserable from a head cold but was sticking with it, ready to go inside and call it a day. And the scalder wouldn’t scald. Fast forward a little bit. Not knowing what the problem was, I decided to try calling Featherman. To my complete astonishment they answered the phone on a Sunday afternoon. They were running a booth at a conference in Kansas. They helped me work the problem to the point that we identified the gas valve as being faulty in some way. Then my father in law stopped by to give me a hand. We found a matching gas valve on an old furnace (amazing what you can find laying around an old farm). With a little scrounging for parts here and there we installed the new valve and fired it up. Sighs of relief all around. Until it broke. You see, in our elation over finding the part we neglected to account for a change in voltage. 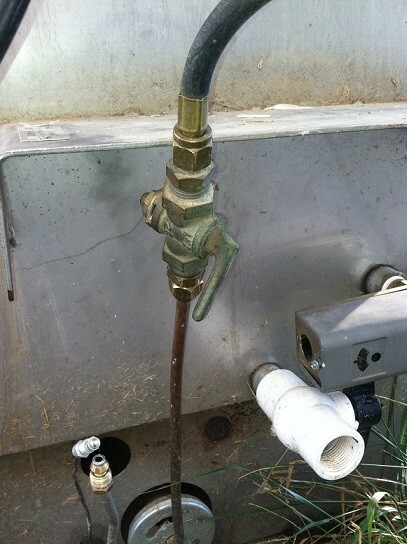 The previous valve was 120v. This one (out of a furnace) was 24v. Yeah. We burned up the replacement. OK. Still tired, still running late, still not daunted. I know there are some brass fittings around here somewhere. Heck with the gas valve. I’ll control the fire manually! After a total of 3 hours testing, brainstorming and scrounging parts around the farm we were back in business. Too late to do all 100 birds but we got 70 before it got dark. No temperature regulation with this design but it’s working until I get my replacement. So the moral of the story is that some day when you are short on sleep and everyone you care about is waiting on you to conjure up a miracle in time for dinner and Star Trek and customers are on their way to pick up birds you haven’t even killed yet you’ll be glad you haven’t thrown away all that junk that is cluttering the machine shed. I promise. Maybe. This entry was posted in Lessons Learned, Livestock Processing. Bookmark the permalink. I’d be laughing, except it doesn’t sound like it was too funny at the time. Glad you got that many birds done. Hope you all got to watch Star Trek. We’ve all fixed many an object with the leftovers and broken-downs in the shop. Thanks for the reminder of why we keep things. Good moral at the end. Things always happen this way.